Five years on from the crash, property prices have hit new highs. Where are home values rising fastest? It's a good time to be a home owner. Property consultancy Knight Frank says global house prices now sit 4% above their 2008 peak and confidence in most markets is growing. 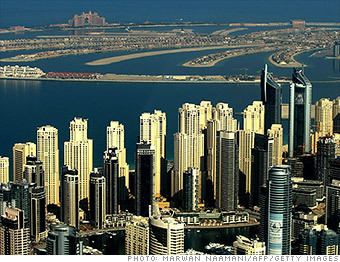 Topping the rankings is Dubai where a steady flow of international capital is powering a property boom. The real estate rebound, coupled with a pick-up in tourism and trade, has boosted the economic outlook in the tiny emirate. Knight Frank's Kate Everett-Allen said Dubai has attracted investment in the wake of the Arab Spring as a Middle Eastern "safe haven." "We're seeing a lot of Indian, Pakistani and Iranian investors in that market," she said. The Knight Frank Global House Price Index tracks mainstream residential prices in 53 countries, as well as Dubai and Hong Kong. It's calculated on a quarterly basis, using official government statistics or central bank data. Results are based on third quarter figures for 2013 except where noted. The index shows how prices have changed over a quarter, six months and a year. CNNMoney has used the most recent year-on-year figures.